As a cosmopolitan city known as “the white city”, beautiful Lisbon is rich in an historic and cultural heritage just waiting to be discovered. Belém Tower, the castle of Sao Jorge and the Jeronimos Monastery are just some of the monuments not to be missed. Between visits, why not take an impromptu shopping trip into the Baixa district, situated between la Praça do Comércio and le Rossio, where all the top brands are well in evidence. In the evening, you can stop in a little square to sample some of the delicious local specialities. Whether with traditional or with contemporary architecture, our villa rentals in Lisbon and neighbouring areas are all tastefully decorated for a luxurious and comfortable stay. Should you require them, additional services are also available, such as babysitting, cuisine, a spa and massage. Set on high hills overlooking the Rio Tejo, Lisbon has long captivated for its vast squares and beautiful art galleries. See you in this vibrant capital to learn more about Portuguese culture. Among the highlights, there is obviously a ride on the #28 tram to visit the most beautiful places in the city. Do not forget to go with your family to Miradoura da nossa Senhora do Monte, from where you can admire the whole city - an incredible view that takes your breath away! For a weekend or for a week you can enjoy the most beautiful places of Lisbon, including the Belém district and its famous tower. After a busy day visiting, do not hesitate to take a break in one of the many cafes or in a restaurant to discover the local gastronomy. All our houses have been chosen to bring you the greatest comfort and the greatest luxury possible. Private swimming pools to relax in the shade, but also heated pools to enjoy the pleasure of swimming a little longer in the cooler season. Some of our homes have incredible views of unique landscapes, so you can leave your everyday worries away from your sumptuous luxury villa. 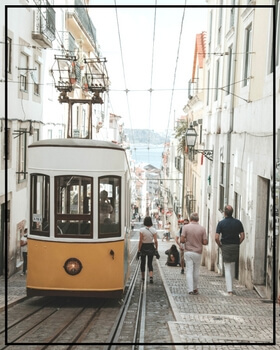 The Villanovo concierge service will guide you every step of the way - no details are left to chance - so that you can spend an unforgettable holiday in Lisbon with your loved ones.